Terry Yeomans, IS-BAH Programme Director, added: “I am delighted to congratulate the team at Oxford Aviation Services Limited team on this great achievement and thank them for their support and dedication to safety and customer service. We now have 100 FBO’s worldwide who have achieved IS-BAH status and we continue to see more professional operations like London Oxford embracing the SMS culture that not only takes the organization beyond compliance but builds on our excellent safety record goal established by business aviation. .
London Oxford Airport is wholly owned by the Reuben Brothers. Their investment activities span private equity, as well as real estate ownership and development. Businesses include data centres, race courses, media, public houses, hotels and metal storage. At the end of February 2012, the Reubens purchased the London Heliport at London Battersea, the UK’s only CAA licensed heliport. The Heliport is a 22-minute helicopter ride from London Oxford Airport. 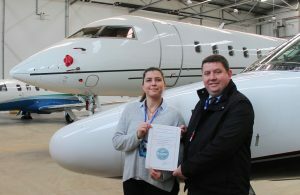 London Oxford Airport has been the fastest growing airport for private business aviation in the United Kingdom over the last five years and aspires to be recognised as a new option for commercial airline services within the Thames Valley region, North West of London.